They were trounced by the B.M.W. in 1939—but had not touched the 1938 machines due to pressure of work for the Government. In all other years they won. 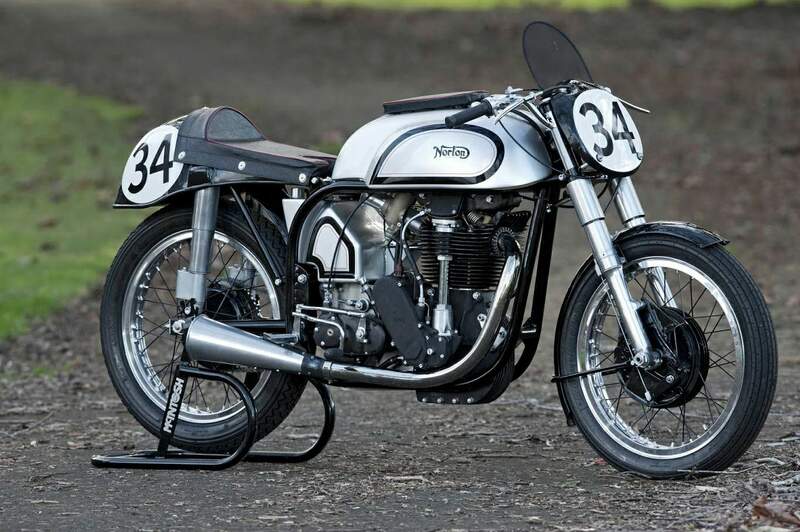 Changes were made steadily to the machine; the gearbox was altered to a four-speeder, plunger rear springing came in 1936 to be followed in 1938 by the first Norton telescopic forks—the first British factory to use them in the modern style. Brakes got bigger and better, and conical light-alloy hubs were used on both wheels, along with alloy rims. In 1930 the engine had iron head and barrel and a horizontal inlet tract. Downdraught appeared in 1931, alloy barrels and heads in the middle thirties and the first double o.h.c. soon followed. All these features were used on the 1949 machine, with alloy tanks, hydraulic damping on the rear suspension, and everything was set to win the T.T. Win it did. Harold Daniell, the man whose 1938 lap record of 91 m.p.h. was still standing (for that was set on the petrol-benzole, whereas in '49 the fuel was "Pool"), set a cracking pace from the start and won handsomely at 8693 m.p.h., only 2i m.p.h. short of the petrol-benzole record average. 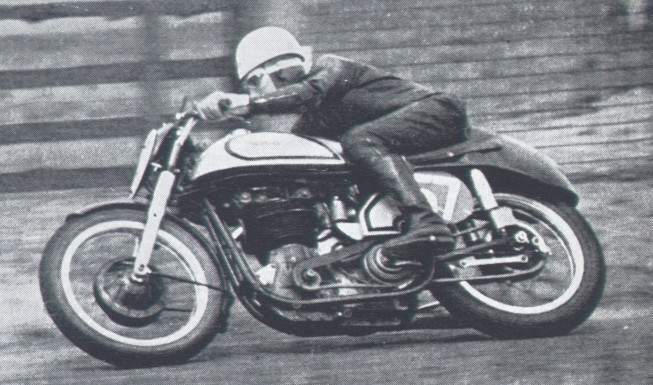 Although the Norton had won, its handling at the very high speeds of which it was capable left a lot to be desired. It was a machine that had to be ridden in rather the same fashion as a high-speed scrambler, with sturdy muscles more or less a prerequisite for success. Over in Ulster a couple of brothers thought they could improve this. . . . Although almost twenty years separated the model shown on the preceding page this 1949 job, the lines of the two machines are surprisingly similar. Keen eyes will that this model has the experimental forks with the large hollow wheel spindle cai in front of the lower members, tried by the factory in the 1949 T.T. camshafts by shaft and bevels. Ignition: magneto.Transmission: chain via four-speed gearbox. 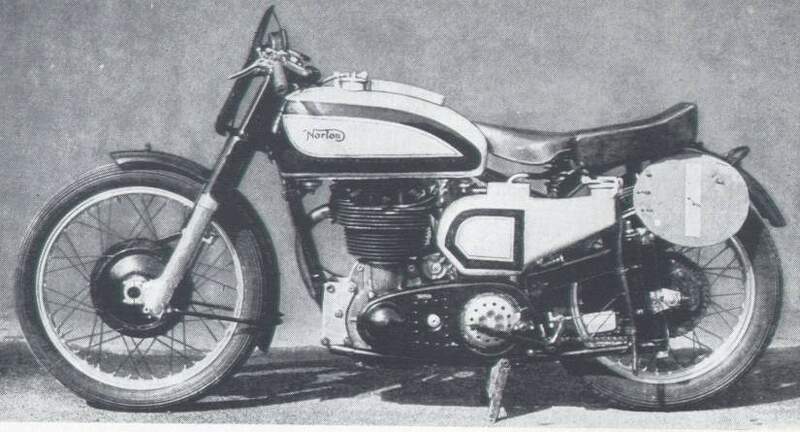 1950 "FEATHERBED" NORTON. 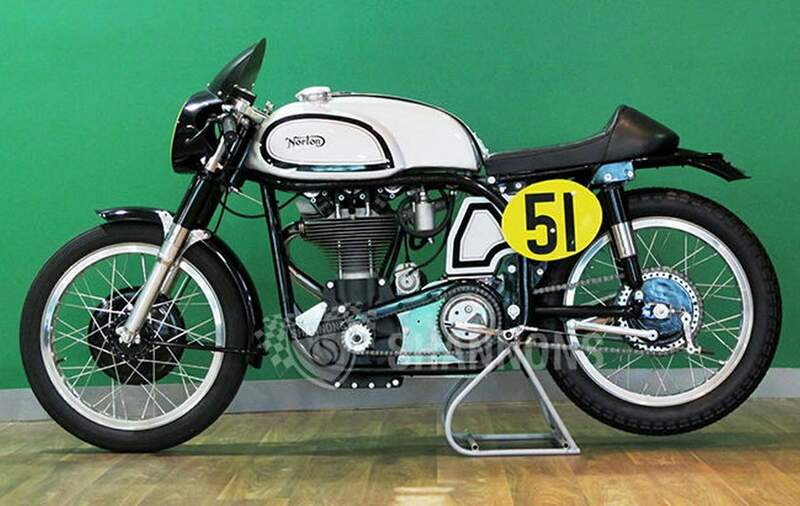 Although Nortons had won the 1949 T.T., it had become increasingly obvious to the development team at the factory, headed by "Wizard of Waft" Joe Craig, that the results of more and more power being wrested from the highly tuned motor was that shortcomings were being revealed in the navigational department—and this on the racing model from a factory whose products were advertised as "The World's Best Roadholder"! Gone was the old "garden gate" type of plunger-frame, with bolt-through fuel tank and vast oil tank. In its place was a new-look racer with swinging-fork rear suspension and a full duplex cradle frame in which the main frame was made of two lengths of tube that swept down from the top of the steering-column tube to encircle the engine and gearbox and then rise vertically to the seat nose, where they curved forwards and returned to the base of the steering-column tube, which was thus cross-braced. Short lengths of tube were welded in between the loops to act as spacers and just astern of the gearbox a pivot was formed between gusset plates to carry a rear swinging-fork. A bolted-on sub-frame carried the seat and mudguard and anchored the tops of the rear hydraulically-damped spring units. [Continued opposite]. camshafts by shaft and bevel gear. Ignition: magneto. Transmission: chain via four-speed gearbox. Frame: full duplex cradle with two tubes forming continuous loop on each side of engine and gearbox and ends crossed to brace steering head; bolted on sub-frame for top anchorage for swinging-fork rear suspension units.